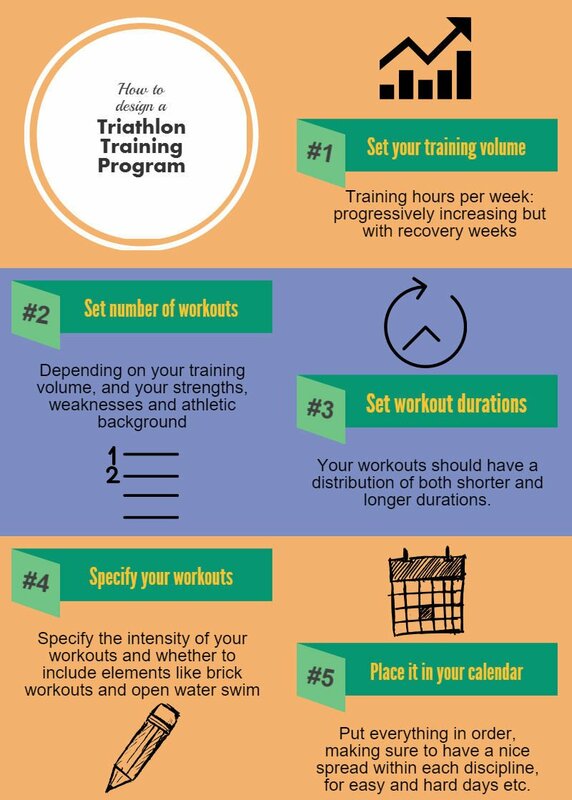 Having a structured triathlon training plan is essential for triathletes of all ability levels. A well-designed training plan greatly increases the return you get on your training investment, and also reduces the risk of injury and overtraining. Many triathletes, especially beginners, base their training on plans they find on the internet that aren't designed for them specifically. Although such plans certainly have some value to them (some of the ones out there are actually very good), they always come with the risk of not being at the appropriate starting level for an individual triathlete. These kinds of problems can present themselves from an overall fitness perspective, with the overall training volume of a program being too low or high for the athlete's abilities, or from the perspective of a single discipline, such as for athletes that are completely new to swimming and have no chance of completing the swim workouts prescribed in a ready-made program. The solution? Design your own triathlon training plan! While that can seem overwhelming for beginners and even intermediate level triathletes, it is definitely possible. In this post, I'll break it down into a five-step process for you to follow when you start designing your own program. If you need more help, details, and examples to guide you, I've also created a free ﻿﻿e-mail course that will guide you through the whole process. Setting your training volume is probably the most important step of all when it comes to creating a triathlon training program. Without enough training you won't progress. Too much, and you will more likely than not be set back by injuries or overtraining. All training programs should start from a level that you can handle. If you've been training consistently, it can be as simple as starting from this same amount of weekly training hours. Let's say you've had a break for a few weeks in the off-season - just scale back a bit from where you were before the break. You should be able to easily handle the volume when you first start a new program. You also need to schedule recovery weeks. Every third or every fourth week, depending on how fast you recover, should generally be a cut-back week in terms of training hours.​ As a rule of thumb, if you're over 40 years old, err on the side of caution and make every third week a recovery week. If you're training for a race or if you're targeting performance improvements in general, your program should be progressive - that is, your weekly training hours should gradually increase. Make sure not to increase your training volume from one week to the next by more than about 20%. 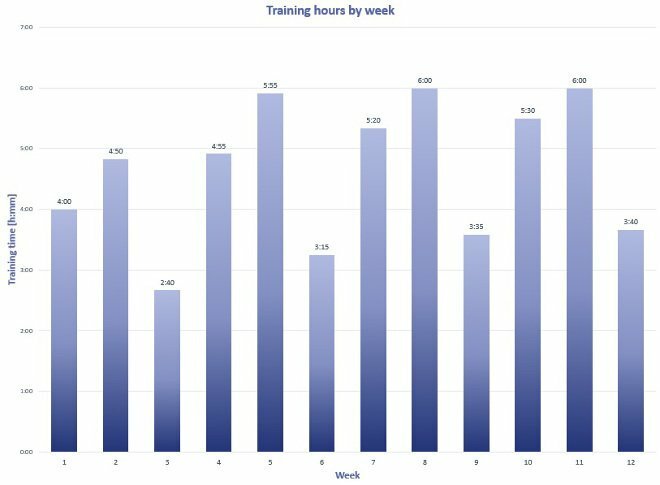 When combining the progression of volume with regular recovery weeks, the ​result is a training schedule with undulating but increasing (up to a point) volume, as seen in the image below, where the weekly hours per week for a 12-week plan starting at 4 hours per week, increasing to 6 hours per week, are plotted. The next step is to decide how many workouts you should do each week, and how many should be in each respective discipline. 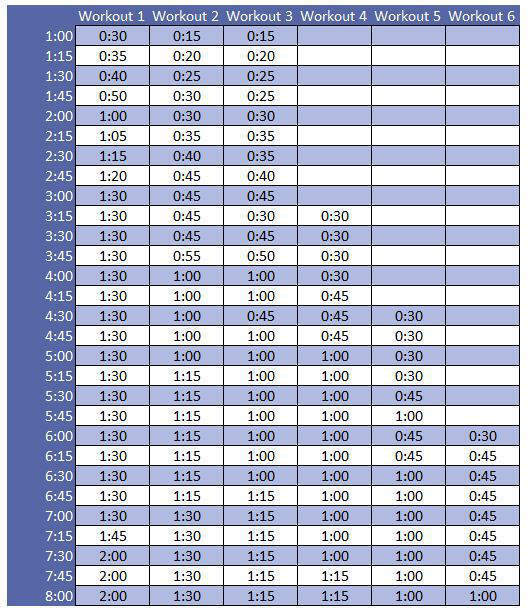 As you can see, there are two options - less frequent, slightly longer workouts, or more frequent, slightly shorter workouts. Generally, if you're very new to the sport and endurance sports in general, go the more frequent, shorter workouts route. Also, if you have a particular sport as a big weakness (such as swimming) do the same - you'll need to do more frequent workouts in that discipline to improve, rather than longer but fewer workouts. We also need to look at how many workouts to do in each discipline. Fortunately, this is easy to figure out. If you can, split the number of workouts evenly between the three disciplines. If you do six workouts total in a week, do two in each discipline. If your number of workouts doesn't result in an even split, then your weakest disciplines get preference. Let's say your weakest discipline is running, and your strongest is cycling. If you'd have four workouts in a week you'd then do two runs, one swim and one bike. If you have five workouts, then you'd do two swims as well. This is a step which is as much art as science. This makes it particularly challenging for triathletes newer to the sport, and I've seen too many athletes do the mistake of just going out and doing the same 45-minute workouts day in and day out. This is counterproductive when you want to benefit maximally from the time you spend training, since each workout, long or short, should have a specific purpose. Long workouts for example have many physiological benefits, such as mitochondrial development and improved glycogen storage, that have great effects on endurance (surprising, huh). Short workouts are great for active recovery, and even as full-on workouts in their own right for those just starting out. Also, for those just getting started doing workouts with some intensity, the amount of intensity shouldn't be huge, so these workouts can be rather short in duration. The point is, you need to do both longer and shorter workouts, you can't just split your weekly training hours evenly over the number of workouts. 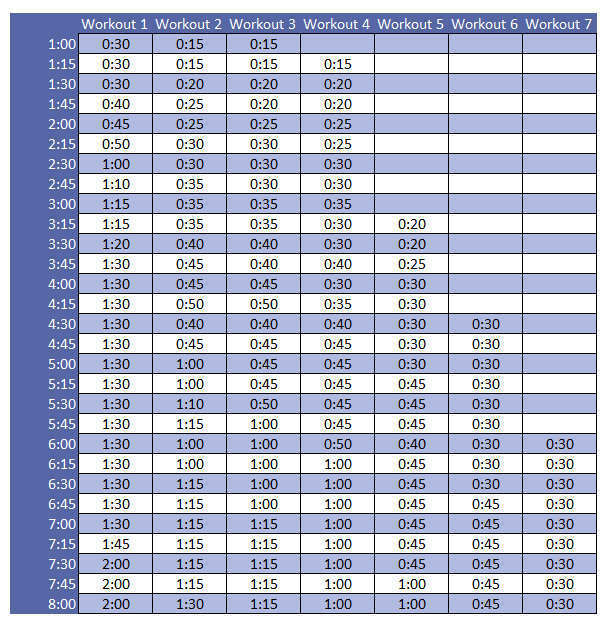 To help you decide how to distribute your training time, I made the tables below as a guideline. The one on the left is for those that found in step 2 that they should train with longer but less frequent workouts, and the one on the right is for those training more frequently but with shorter workouts. Click image to zoom. Longer, less frequent workouts. Click image to zoom. Shorter, more frequent workouts. ​So, when you know your weekly training hours and your number of workouts, you'll get the duration of each workout right from these tables. For example, if you're using the left table and have 4 hours scheduled for a week, then your training sessions would be 1:30, 1:00, 1:00 and 0:​30. Your longest workout should be a bike (or brick) workout. ​You should do shorter workouts in your weaker disciplines. For the second principle, don't make the mistake of stacking all your shortest workouts onto your weakest discipline. Let me explain with an example. The longest workouts will always be a bike, but of the following two workouts in length, one will be a swim and one a run. In this case, both are 1:00 long, so it doesn't matter, but as we cycle through once more, we see that we need to split a run and a swim over a 0:45 and a 0:30 workout. Principle number 2 simply states that your weaker disciplines will have shorter workouts, so the 0:30 workout would be a run, and the 0:45 a swim. This is were things get messy! Specifying your workouts means deciding whether to add some intensity work to them, add brick workouts (bike + run workouts particularly), do open water swims or pool swims and so on. There are a million ways that you could do this, and going through the exact process of deciding what to do and why is way beyond this blog post. What should I do in the pool versus in open water? Should I do tempo runs or faster intervals, or even both? Hill reps or big-gear workouts on the bike? Again, this is as much of an art as a science. There are a few main things to keep in mind at this point in designing your triathlon training plan, but to get additional details and more in-depth examples I'd again encourage you to check out the e-﻿﻿mail course to make this step a bit less overwhelming. If your program culminates in a race, try to get in at least 3 bike + run brick workouts and open water swims before that. If you have been doing triathlons for a while, then you can choose to add brick workouts and open water swims to your program even if you don't have a race coming up. Don't add intensity in a discipline that is completely new to you. Focus on building an endurance base instead. At most 20% of the time you spend in any single discipline should be high intensity work. Workouts that don't have any of the "special elements" mentioned above can be labeled "recovery", "easy" or "steady" workouts. Err on the side of easy workouts and recovery workouts, since many triathletes have a tendency to go too hard too often, so what should be a relatively light steady workout can turn into a race. We're getting close now. All that remains to do is taking your list of workouts that you have planned for each week in your program, and putting them on specific days in your calendar in a clever way. Spread out your workouts and rest days. Spread out workouts within each discipline. Spread out your hard days (long workouts or intense workouts). This isn't too complicated to be honest, these principles are all quite self-explanatory. Train three days straight from Monday through Wednesday and then rest Thursday through Sunday. Running (or swimming, or biking) on two consecutive days and then having five days until your next run. Do a hard run, a hard bike and a hard swim on consecutive days and then doing only easy or recovery workouts the rest of the week. Hopefully these examples of mistakes clarify the above principles so you can finally complete your brand new training schedule and start training with structure! To wrap up, I want to summarize a couple of key takeaways, but also give you some words of caution. First, you should have a training plan, even if (or perhaps more accurately especially if) your completely new to the sport. But, and this is an important but. Never become a slave to your plan. Your training plan is just words on a paper, or in a spreadsheet or wherever, but the way your body is responding to the training that you do is the ultimate determinant of your success relative to your goals. This means that if you're constantly tired, injured or lacking mojo, your plan is probably way too challenging for you, and you should scale back. If however, you never feel challenged at all and your performances in races and training have plateaued, then you're not challenging yourself enough for further improvements. I hope you found this post really useful! Please take a second to share the post with friends or on social if you did find value in it. This is exactly what I’ve been looking for, simple enough for a relative newbie to understand but comprehensive enough that I feel that I can build myself a robust plan. Have also signed up to the emails for extra help. Glad you found it useful Paul! The emails do provide some additional help with a spreadsheet template and a walkthrough of a specific example.